School librarians know that collaboration is an important if not vital role we play within the school learning environment. However, a litany of factors can often cause collaboration to be sparse to nonexistent. Sarah goes on to give some great tips that super busy librarians can use to encourage collaboration. Sarah’s article is but one of many that address and readdress the topic of school librarians and collaboration. I propose looking at collaboration from a completely different point of view. We all know the value derived from getting to visit other schools or to even just sit in the class of a colleague in your own school for a class period or two. Observing and learning from others helps to make us better in our own educational fields. Let’s kick that up a notch and think about how our students learn best. Do they learn better through passive observation or from active engagement with peers to discuss, explore, learn, create and deliver what they have learned? Yup. Hands on collaborative learning wins out every time. So why are we not applying the same methods that work best for students to our professional learning as educators? I propose that we look at collaboration as the ultimate professional development experience, not only collaboration with the school librarian but collaboration with other educators as well, whether in your school, your district, your state, nation, or around the world. Through true educator collaboration great minds come together to formulate never before thought of lessons that ultimately enhance the student learning experience. This week I had the opportunity to work with and learn from four incredible colleagues. On Monday Ms. Meleighsa McLaughlin brought her 9th and 10th grade English classes to the Harvard Room so that I could show them a few helpful tips and tricks for their upcoming research paper. In Alabama we are fortunate to have the Alabama Virtual Library (AVL) that supplies all Alabama students with access to a large variety of databases. One thing the students like the most about the AVL is that the works cited information is already created for them to simply copy and paste to their research paper. (Where was this when I was in school?!) Not all information students will use in their research papers will be accessed through the AVL so I also introduced students to the EasyBib Google Docs add on. The students absolutely LOVED this! 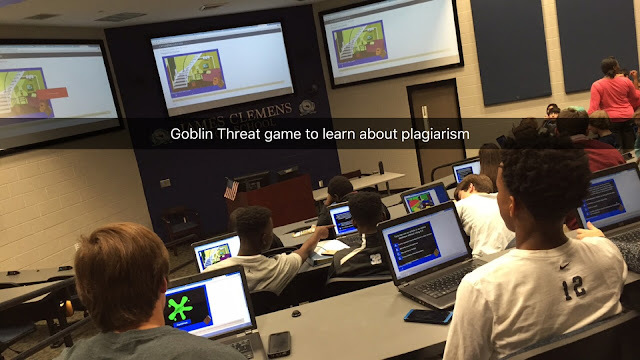 The last thing I showed to Ms. McLaughlin’s classes was the Goblin Threat Game. This game was designed by the Snowden Library of Lycoming College. It is a fun interactive game that teaches students about plagiarism and works cited. Wednesday is Story Time Day! YAY! I look forward to Wednesdays every week. This is the day that Ms. Shannon Humphrey and Mr. G Watters bring their special education self contained students to the library! This Wednesday we read the book, A Boy and a Jaguar by Alan Rabinowitz. This book is the true story of how Alan overcame stuttering and became know as "the Indiana Jones of wildlife conservation". After reading the story we watched a video where Alan talks to the students about his journey and how it felt to have a disability. While the kids love storytime their favorite part of coming to the library is the MakerSpace! The JCHS Library MakerSpace can be loud and overcrowded most days especially during Refuel Hour so Wednesdays a special day just for our storytime students. I love that I have this opportunity to spend time working with such awesome students and their teachers. Thursday I went to Ms. Leah McRae’s Biomed class to teach students how to make infographics using Canva for the data they are collecting on proteins. We also explored Thingiverse so that students could create 3D models of their proteins in the JCHS Library MakerSpace 3D printer. As I was getting ready to leave Ms. McRae’s class it occurred to me that we could make the projects even better by adding the element of augmented reality to them with Aurasma. I am super excited about continuing to work with Ms. McRae and her students as they bring their projects to life. Friday brought Ms. Laura Smith and her Career Prep students to the library to explore, discover, tinker, and create in the JCHS Library MakerSpace. Believe it or not, many students in our school have yet to discover the changes that have taken place in the JCHS Library this year. It was invigorating to get the opportunity to work with Ms. Smith’s students as they explored the robots, green screen, 3D printer and more. I hope that more teachers will take some time to bring their students to discover the JCHS Library MakerSpace. If you have been inspired to collaborate why not get started with the Global Skype-a-Thon, December 3-4, 2015.